Microchips are a very popular means of permanantly identifying your pet and helping in the recovery process if they are to escape or get lost. The chips are sterile, inert, and tiny. This means that they are designed to be inserted under your pets skin and remain there for life. There are rarely any complications except that sometimes a chip can move under the skin and end up in spot that doesnt get read by the scanner. In these cases it is wise to place a second chip, but the old one does not need to be removed. Getting your pet microchipped is only the beginning step in the process of making certain that your pet is returned to you. Next you need to ensure that the microchip company has your updated contact information and or that you have registered your pet and their chip on a national registry database. This will help recover your pet in the event that they are lost. 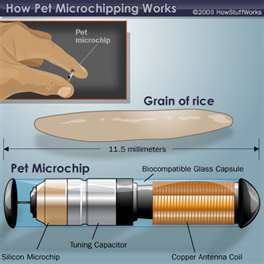 At Wandermere Animal Hospital we use Microfindr microchips. They use a standard frequency and are good in case of international travel. They are registered for free using Petlink. PetLink is a universal national recovery database that any chip can be registered with. If you want to register your pet it may be free depending on the brand of microchip or it may cost a one time fee of approximately $17. Avid is a common brand of microchip used. They have their own database with an annual registration fee. Homeagain is also a common brand of microchip used. They have their own database with an annual registration fee.